What is the max resolution it will transfer? Will it transfer 1080p resolution? BEST ANSWER: I have experienced drop out in the process of converting VHS to DVD. However I found that because of the number of devices in the process the cause varied from incident to incident. For example my Laptop is 8 years old with limited RAM and Video card.. When I attached the Grabber and VCR, with the same VHS, to a well equipped Desktop unit I had no dropout. But even flaking old tapes could dropout on a one time (transient) basis. Sometimes I changed between two VCRs to solve a playback (compatibility) problem.. This device is only going to convert the video it's receiving to USB. Depending on the software you use you can make the display as large as you like but you're still subjected to the original resolution of the device attached. If you were capturing from an original Nintendo entertainment system for example your resolution would be 256x240. In this example you could display the Nintendo on a monitor designed for 1080p but at that size you'd be seeing all of the imperfections of the Nintendo's output. I tried to capture some vhs and it dropped most of it. Bought a dedicated card and that worked. I want transfer my VHS videos to DVD. Is this the one I need? Does this unit work on Windows 10? Have never used it. Bought it as a backup to a VHS to DVD recorder. Did you use with a laptop or desktop? I can't get this to work with my laptop, 64bit, running windows 10.
will this capture any device?? BEST ANSWER: Honest answer is No because of the word "any" Example. 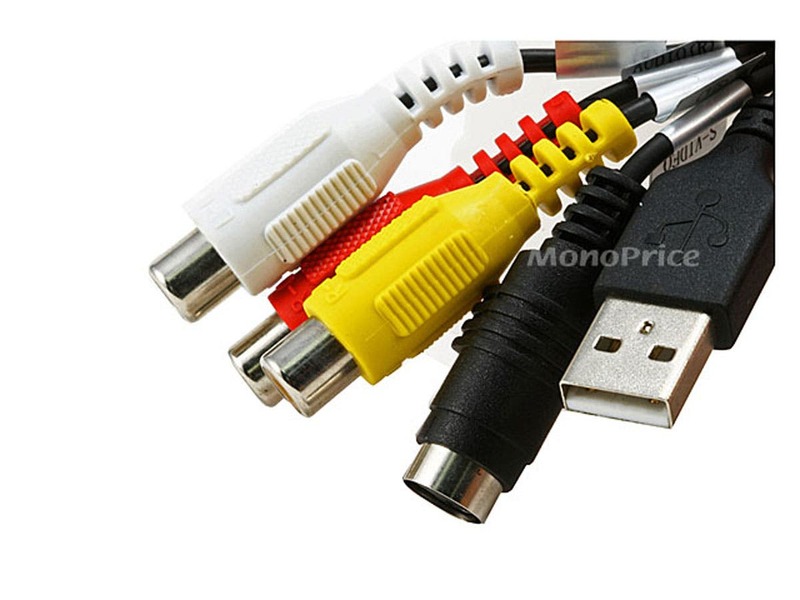 This device can Grab from a DVD in a Dual VCR/DVD player but it cannot Grab from a DVD player with only an HDMI output.. Not directly.. Lots of variations on the market. I bought this a few months ago and works great. I have an old VHR and worked with absolutely no issues. I assume any device with the red/white/yellow output will work fine. Yes. Any device that has rca video and audio out or s-video out will work. Could I use this to game N64 on my computer? If you have a composite or svideo output on your N64 then yes you can display the video output from your N64 on your computer and record the video. Is there a Mac driver for this? BEST ANSWER: No. Absolutely not. Is this device compatable with 32 bit Windows 7 Embedded? BEST ANSWER: Yes it is. However I used it with Nero Classic 2016 which was already installed. I have not installed the software that came with the Monoprice Grabber. want to transfer old vhs home movies to dvd using windows 10 , do I need a 3rd party editor, what exactly is that?. I have a vhs player, and access to a dvd recorder-- do I need the computer or will a tv monitor be the way to go--sorry but I am a novice at this stuff. The software included would not be for editing but the movie maker that is built into windows would probably be enough to edit the videos you would want to make. 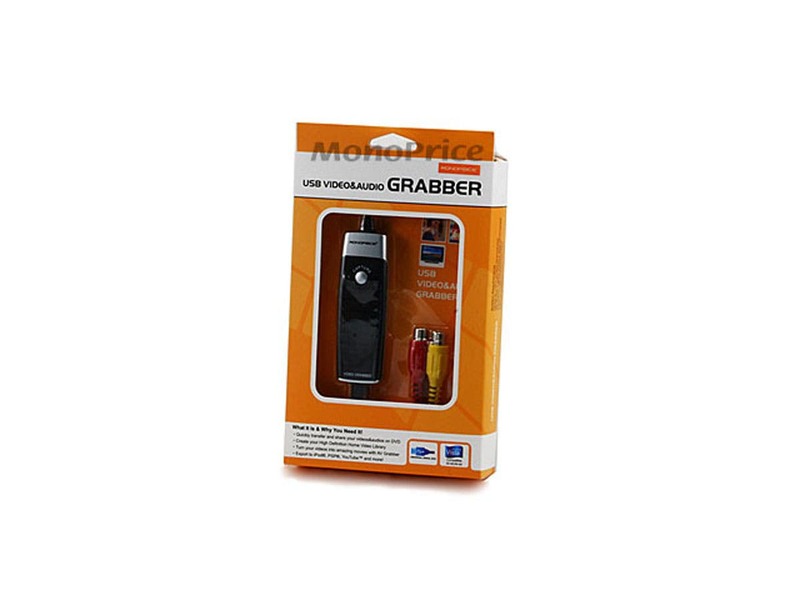 You would use this grabber to connect either your DVD recorder or VHS player and computer. 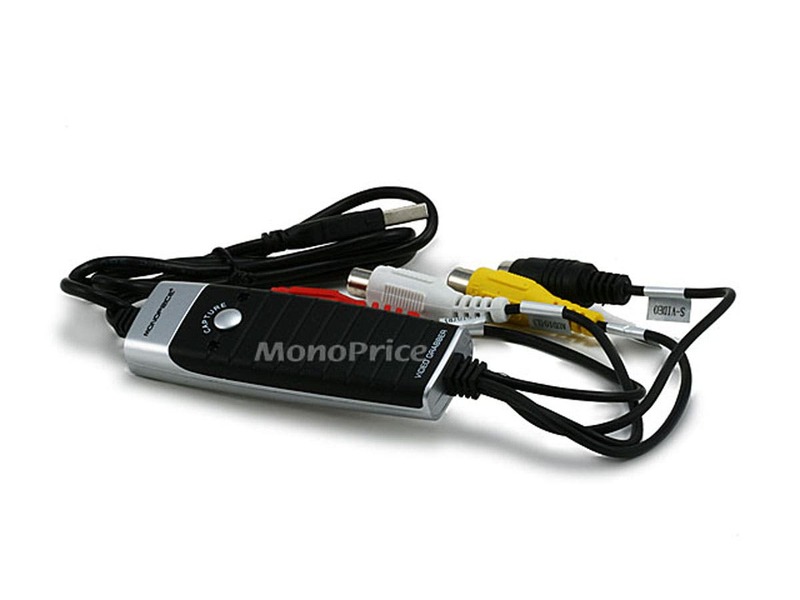 capture card is compatible for window 7 32 bit and captures ntsc and captures to any device? Cannot rate yet as my system found the driver provided to be unacceptable and I have yet to be able to download one from your site that works (with Windows XP). I have had a SIIG Grabber for a few years for personal use. I saw the Monoprice Ad and their device looked very much like the SIIG. I figured that for the price it was worth having a second device so I would not have to switch one between my Laptop and DeskTop. It arrived two days after I ordered it. I tested it on both my computers, two different software, and both software detected it as if it was the SIIG device. I Love it. I have not yet used the software that came with the Monoprice Grabber. The only frustration is that I cannot figure out what the two LEDs and the Button are for. The manual lacks that info. Not very easy to install; took several tries for the system to recognize the CD code. Video transfer is not seamless, lots of blank black screen. An other tries the video transfers in black & white and is very jaggedy. This unit works, but the software will only produce an .asf format. In order for this to be usable it has to be converted to a usable .mp4 with another program. The software will not allow saving directly to .mp4. Does capture a clean image. Works efficiently with the CORRECT software. Best results with (ArcSoft Showbiz). So far seems to work as advertised. Delivered on time. Easy to use. Performs well. Everything I could expect. And a good price. Affordable and most important, it does its job!!! Recommended! Great! But software has some issues. I love the converter! However, the software is a little quirky on my Windows 10 computer. Like if I'm switching between projection modes the recording stops without saving and starts again wherever the tape currently is playing. Thus loosing the first half of the tape. The image that shows what's playing is also off-set from the window position, but it still captures everything. All in all, I would recommend his product to anyone! Excellent quality from our old VCR machine. The video files work well. Because I was using Windows 10, I had to apply the audio patching so the recorded file had audio. I had to use Freeware Software (Machete Lite) to clip off the nasty part at the start and end of the recorded segment because it is virtually impossible to start or stop recording at the right spot. Often a LONG blank part at the end, sigh!) Also used it to stitch the pieces created from long tapes. 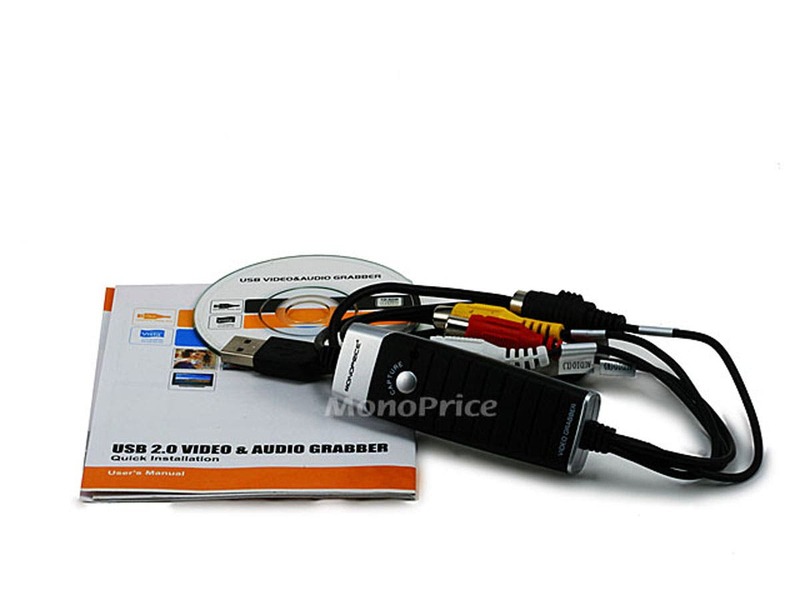 For 2 hour recordings, the included BlazeHDAV software created 2 video files. Home Run! Now I can trash the old tapes and get rid of the VCR.